Here’s a metal thing with chains on it. 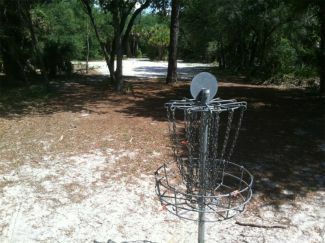 After another NEFA golfer mentioned his appreciation for the North Port Charlotte Regional Disc Golf Park, I thought, “Hey, yeah- I love that course too! I’ll write a review of it!” …then I decided to search my own website: and turns out I already wrote one. You can see it HERE if you want. So why am I still writing about it now? Simple- they redesigned it. I’m not going to break down every hole, or describe the course in great detail. I’m simply here to endorse it. I’m a Massachusetts based disc golfer, and North Port Charlotte is the closest course to my Aunt who lives in Florida- so it’s a sort of second home course. The local players in that area can do a much better job explaining the nuances of the course. I just want to hit on three key points. 1.) The newest layout is the best one of the past 4 years. 2.) The course is very well maintained with great tee pads. 3.) The course has a recurring theme of low ceiling, narrow fairways that have a slight left to right bias. Three years ago I remember playing this course with a homemade basket on one of the holes and there were more than a handful of very quirky layouts. The general flow left you scratching your head. I actually remember how disappointed I was on the last hole each time I played it because it was such an easy birdie. It isn’t very often I complain about a birdie. In any case, fast forward to today and this course is light years better. It uses the same basic area but really stretches the holes out and gives even a talented disc golfer a satisfying challenge. It may be because it’s located within a very large baseball facility with multiple baseball diamonds which are fully fenced in- but for whatever reason, this course is well maintained. There isn’t a feeling of overuse, and I rarely saw trash thrown on the ground. I suspect that the athletic fields surrounding the course set the stage with a good example, and there must also be a decent presence of facilities workers around. I’m not saying they pick up after disc golfers, but it’s worth mentioning since it makes the course less secluded and prone to being trashed. And like I mentioned earlier- they have great tee pads: large, flat and made of cement. Here’s a good example of a hole that has that narrow, low ceiling- with a slight turn. Finally- the fact that there are multiple holes with a similar theme was fun. It isn’t repetitive as much as demanding. I equate it to playing a long, open course with multiple par 4’s over 700-800 feet because in that instance you’re immediately aware of the kind of shot required to play well. This course keeps testing that part of your game: the narrow, low ceiling, straight shot with distance. Can you keep the disc low enough, but still get the distance as well as control the turn of your disc? There are a lot of players who can throw decent back hand hyzers because they happen naturally. A spike hyzer is a bit harder to be accurate with, but it’s still a shot with few variables. Once you are forced to keep control over turn, altitude and distance things start to heat up. Thankfully, the whole course isn’t the same though. I’d estimate that there are at least 6-8 holes that have a similar long & narrow theme. There are a couple wide open distance shots as well as a couple shorty “putter off the tee box” holes. As I mentioned in the last review of this course, I don’t always enjoy being a visitor to a course that has multiple tees and baskets- because I may not be playing the most common layout. Or I could be mixing up two different common layouts. This isn’t a legitimate gripe though, since if I played this course 3-4 times a week, I’d want the variety. One thing I can say about the alternate tee pads and baskets is that they do a good job of changing them up. They aren’t just all “50 FEET LONGER.” There is a mix of left, right and added distance. In conclusion: go play this course. 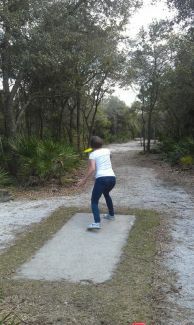 This entry was posted in Course Highlights and tagged charlotte, course, disc, golf, north, park, port, regional, review. Bookmark the permalink.